Mystery lady number 1, the elder Dr. Lee-o-netto has a lot of missing information. If she had not been living next door to Laton & Marleah in the 1892 State census, I may never had found her in census at all. A news clipping a month prior to this census, suggests she was a resident of Buffalo at that time. According to news clippings she did move to Machias before the end of 1892, so her stay in Stockton was probably very brief. This demonstrates the importance of always looking at the near neighbors in census records and of having a good ol’ fashion dose of good luck on your side. The 1892 Census and her Machias biography are the only two items connecting her to the Kanistanaux family. I have already explored the identity of her mother without much luck. Catherine Moulton is likely too old to be her mother, but Marleah is a good age for the job. Finding a marriage record may provide names for her parents. The 1892 news clipping shows she purchased a home in Machias about January of 1892. The Machias biography was published in 1893. She arrived just in time to be included. Talk about luck! Without this biography, I might never have known to even look for her. Two very lucky events occurring for one person. I think she wanted future generations to find her! Searching land records for Cattarugus Co., could be productive. The 1892 news clipping suggests perhaps she, rather than her husband made the purchase and the clipping refers to her as “Leonetta, the Indian Doctress”. I should look for land records under both her name and his name. She didn’t stay in Machias long because she is in Pomfret by 1900. Speaking of “Indians”, no race is given in the 1892 census and she is “white” in the 1900 Census. On the 1900 Census she claims to be married for 12 years, placing the marriage at about 1888. However, I don’t know where she was in that year. The 1892 news clipping suggests she was a resident of Buffalo when she purchased the Machias home. Perhaps she was married there? Holly Cow! Before finishing up this posting I decided to take another stab at locating more records. I was searching for her husband, Charles, and what do you know – floating near the top of the search results is a marriage record. It wasn’t there 2 months ago. I never would have found it the old fashion way – before internet! I found it on FamilySearch but it is only a transcript. Getting a copy of the actual record will now be my top priority. A marriage took place in Warren Co., PA on 14-Aug-1888 between Charles J. Dodge age 39 and “Nettie Kineiss” age 35. Wouldn’t it be nice if the actual marriage record provides the names of their parents and/or birth locations? I’m not going to get my hopes up, but it’s possible. Her age if off compared to the two census records I have. This record would put her birth about 1853, making her at least 5 years younger then census ages. Still, I am quite certain this will turn out to be the right woman. I did not expect to find her using the Kindness surname. Does this mean she was born a Kindness? The other possibility is she had a prior marriage to a yet unknown Kindness. I don’t want to take too much time to speculate until I get the actual record in hand to see what information I can mine from it. The online record is a transcript of a county index record which was probably extracted from a town or church record, so there is lots of room for errors to creep in. So, where is Warren Co., PA.? Just south of Chautauqua & Cattarugus Co., NY and west of Tioga Co., PA where Dr. Isaac Kanistanaux is found. Finding her as a Kindness and possibly younger makes Isaac Kindness/Kanistanaux an even more likely father (or perhaps her spouse?). Neither Lee-o-netto nor Charles are found in the 1905 NY State census. 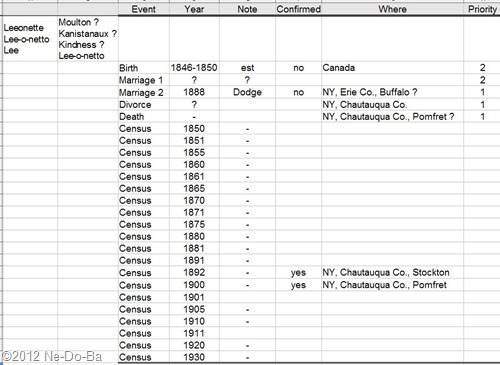 A man fitting Charles is found in Jamestown, Chautauqua Co., NY in the 1910 to 1930 Census as a boarder. I am pretty sure this is the right man, since he is always listed as a house carpenter, which was the occupation of Lee-o-netto’s husband. In 1910 he is listed as divorced, but in the other two census he is listed as a widower. I suspect Lee-o-netto died sometime between 1900 and 1910 and perhaps before 1905. She and Charles were in Pomfret for the 1900 census, so that is the last place I have for her and the best place to begin searching for her death record. Is it a coincidence that Henry Kanistanaux is found in Pomfret in the 1905 NY State census? The 1900 Census lists Charles as a renter, so it’s not likely Henry inherited a house, but perhaps I should still look for land and probate records for Lee-o-netto just in case. In the two census records I have for her, Leonette is consistent about her birth place being Canada. She specifically mentions Sherbrooke and Lennoxville in her biography, which are places near to each other in Quebec. However, I need to narrow down her birth year and determine a maiden name before I can think about trying to locating a birth record. I have a birth range of 1846 to 1853 for Leeonette. No matter which birth year, she is unquestionable too young to be mother of Carrie and probably Henry. She could be their older sister. Even if she was born as late as 1853, she would be old enough to be a mother to young Lee-o-netto (at age 16 to 23) and William (at age 20 to 27). One item I want to add to my to-do list is actually a project unto itself. I want to take all the news ads I found for the Doctor that state where she will appear and when and plot them on a timeline map. This will show me what kind of schedule she kept and how far she traveled on her monthly circuit. I may be able to determine the exact route or means of transportation she used. Much of this is for my own personal interest, but it could also help locate more pieces of the puzzle. How could this help? Any hotels mentioned by name in the ads could be researched. Historical Societies that cover her territory could be contacted. The search would be to locate flybills, posters, publicity photos, more news clippings, information about her medicines, important people she may have treated, and perhaps even letters to patients. There is no limit to the possible artifacts out there just waiting to be found. This sub-project should include Marleah, since I also have a reasonable supply of raw data for her as well. This project is not a high priority for me at this time. If I have any readers who like to do this kind of detective work, perhaps you would like to volunteer? I would happily provide you with everything I have for data on these ladies.